Our incredible condo/vacation home is located on the 2nd floor right in the heart of the resort. You will feel the comfort and luxury a soon as you enter the property of Island Vista. 'Island Vista' was built in 2006 with all first class amenities and is tastefully decorated in a 'British West Indies' flare. Known as 'Island Vista', our condo has a true resort feel and is located in a quiet residential neighborhood known as the 'GOLDEN MILE'. Located on over 500 feet of sandy beach, Island Vista is situated on one of the least crowded areas in Myrtle Beach. You will be near the action and away from the hustle and bustle of the downtown area. As soon as we walked on the property of Island Vista, we knew this was the place we would call home. Our condo is very spacious (50% larger than the typical Myrtle Beach Suite) and has all the upscale interior appointments such as granite counter tops, tray ceilings, tile flooring & a Jacuzzi tub you should expect. Our home is DIRECT oceanfront and offers spectacular ocean views from the living room and kitchen area as well as the master bedroom. It also includes a large living room and a dining room for family dinners and each bedroom is equipped with a 32' LCD flat panel TV and a private bath. The large master bath also offers granite counter tops, double vanities and a large Jacuzzi tub. And don’t forget we have a “FULL SIZED” washer and dryer in our condo for your convenience. We have all the amenities at our resort and the area is just perfect for your family. And since the weather is wonderful all year long, whether you’re here for a family vacation, a winter retreat, a romantic getaway, a men's golf retreat or even a girl’s weekend getaway, “Anytime is a Good Time” to visit Myrtle Beach. But even if you want to just hang out, 'Island Vista's' onsite restaurant, Tiki hut bar and grill, wonderful pool complex, hot tubs, tanning lawn and the list goes on and on, make it the perfect getaway!! Even though our kitchen is wonderful and totally stocked with everything you need, you might want to visit the full service upscale restaurant in our resort, 'The Cypress Room” which has one of the best breakfasts on the Strand. It is open for breakfast and dinner daily, so enjoy the oceanfront dining at its best. This restaurant opened in the original Sea Island 30 years ago and has created a following of locals. It is recognized as one of the best on the Grand Strand. When you find yourself lying in the sun around one of the 3 pools, you can also enjoy the “Tiki Hut Bar and Grill”, a favorite of ours featuring frozen drinks, cocktails and casual food at reasonable prices. We hope you decide to choose our home away from home for your vacation. I’m confident you will start building family traditions and memories of your own in our beach haven. Our home offers elegant comfort, extra room for relaxing and a view of the beach that will last in your hearts long after your vacation is over. We know you will enjoy your time and hope to welcome you as a valued guest that visits with us every year. My wife Lisa and I were married in April of 2007 on the property of our condo at Island Vista. We have 2 children, Michael age 20 and Morgan age 17. We love to spend quality time together at the beach as a family. I am a general contractor in the Baltimore area and Lisa is a physician's assistant at a multi-specialty healthcare group specializing in primary care. My wife and I have been vacationing in Myrtle Beach for the past 20 years and we were finally able to purchase a place of our own. After an exhausting search we stumbled upon 'Island Vista'. Our condo was built in 2006 with all first class amenities and is tastefully decorated in a 'British West Indies' flare. Known as 'Island Vista', our condo has a true resort feel and is located in a quiet residential neighborhood known as the 'GOLDEN MILE'. Located on over 500 feet of sandy beach, Island Vista is situated on one of the least crowded areas in Myrtle Beach. You will be near the action and away from the hustle and bustle of the downtown area. As soon as we walked on the property of Island Vista, we knew this was the place we would call home. Even during the busiest weeks in Myrtle Beach like the 4th of July week, you will be amazed that it really does not feel that crowded. It is truly a place to relax and rejuvenate. We have bath and dish towels as well as a few beach towels. You are encouraged to bring your own beach towels. Absolute beautiful property and the owner couldn't be better to work with. The condo was very nice, and its location couldn't be beat. There is a DG nearby to pick up items such as soap, paper towels, and toilet paper. It was very convenient to park, walk through a couple of doors and into the rental (especially when our arms were full). If we come back to Myrtle Beach, I'd gladly stay here again! Extremely clean, well maintained, and convenient in many ways! The condo was beautiful. Thank you Gary and family for creating such a clean and comfortable environment for your guests. The extras such as towels and beach chairs to name a few were so convenient. And the welcome emails were helpful in knowing what we needed to pack and where we could go for fun!! The condo being on the second floor is AWESOME, especially for people like me who is a little uneasy when staying on super high floors. We were SO sad that our stay was cut short due to the hurricane, but the kindness Gary showed during that experience is one of the many many reasons we can’t wait to come back and book our stay with you again!! Island Vista in general is fabulous. The pools were clean and it’s amazing how close we were to the ocean. Something that we personally think was a big difference compared to other places we have stayed. Very convenient if you have little kids. We did get to enjoy the on-site restaurant once during our stay and the food was great as was the food and drinks at the poolside tiki bar. Thanks again Gary!! We will be back as soon as we can!!! And will highly recommend your place to friends. My family and I had a wonderful stay. The room is spacious and has a great view. The resort is steps to the beach which is fantastic. We absolutely loved it! The Persingers are great to rent from. We had a great time. Island Vista was built in 2006 with all first class amenities and is tastefully decorated in a 'British West Indies' flare. Known as 'Island Vista', our condo has a true resort feel and is located in a quiet residential neighborhood known as the 'GOLDEN MILE'. 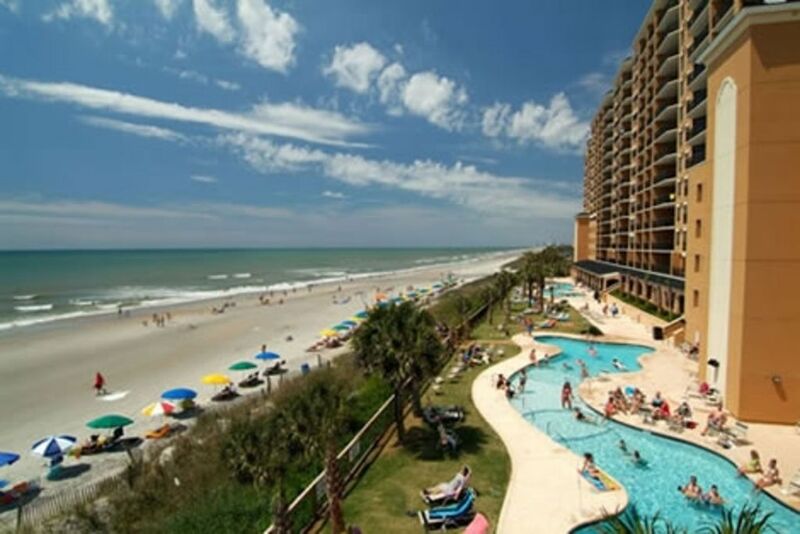 Located on over 500 feet of sandy beach, Island Vista is situated on one of the least crowded areas in Myrtle Beach. You will be near the action and away from the hustle and bustle of the downtown area. Island Vista is 8 miles from the airport and is a short distance to Broadway at the Beach, Barefoot Landing, Myrtle Beach Convention Center and the area's premier golf courses including Dunes Golf Club. Also nearby is restaurant row and the new Hard Rock Amusement Park.